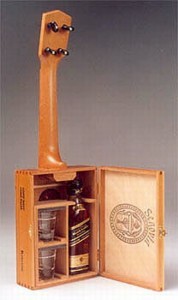 There’s at least one benefit to the recent resurgence in the popularity of cigars. Recycling these elegant containers allows them to fulfill their highest destiny . . . as ukuleles. The CEEGAR BOX utilizes the genuine article, adding a Spanish cedar neck, mesquite fingerboard, and a braced, hardwood top to create a ukulele with surprising tone, playability, and class. If Bo Diddley played the uke, this would be it. Researchers at Earnest laboratories have come up with a new product designed to satisfy aficionados of two of America’s favorite pastimes . . . playing the ukulele and indulging in spirit refreshments. 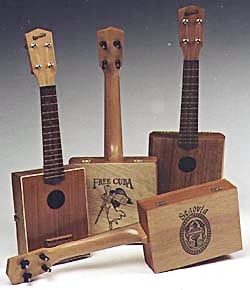 The Hootchulele is a fully functional cigar box ukulele, concealing a custom fit (removable) mahogany “home entertainment center” with two shot glasses and a bottle of 100% pure “ukulele libation fluid”. The Hootchulele is perfect for those looking to discreetly smuggle their pleasures in and out of home, office, or speakeasy. 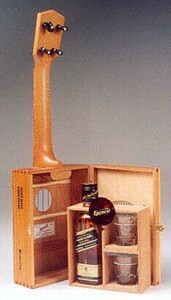 Whether one is just a tippler or looking to get “sloshed in the ozone again”, the Hootchulele is like a party in a box . . . just add music!